Silver Bear Resources Inc.: High Gr | Silver Bear Resources Plc. TORONTO, ONTARIO--(Marketwired - Nov. 26, 2013) - Silver Bear Resources Inc.(TSX:SBR) ("Silver Bear" or the "Company") announces that it has identified three prominent high grade silver zones averaging greater than 1000 g/t Silver near surface on its Vertikalny deposit. Combined, the zones have a total of approximately 5.7 million oz at 2041 g/t Ag of estimated inferred mineral resources and 5.1 million oz at 1569 g/t Ag of estimated indicated mineral resources, details are shown below in Table 1. The company's Vertikalny deposit is located within its Mangazeisky License area in Yakutia, Russia. In September of this year (see Sept. 3, 2013 press release), Silver Bear received its mining license for the Vertikalny deposit from Russian authorities. Table 2 delineates the Company's mineral resource estimate prepared in accordance with National Instrument 43-101 covering the total license area. "This information confirms the potential that these areas could supply early high grade ore for processing using cost effective open pit mining methods," said Mark Trevisiol, President and CEO of Silver Bear. He added, "The identification of these high grade silver zones is valuable on its own, having the mineralization near surface just makes this project all that more exciting." 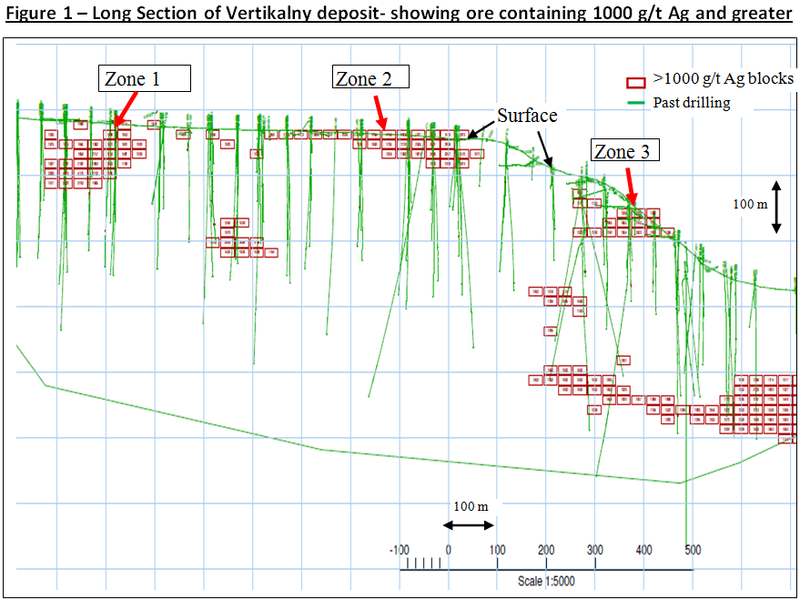 Figure 1 is a long section through the Vertikalny ore body. The high grade zones near surface identified as Zone 1, Zone 2 and Zone 3 show the relative location of the areas where silver grades are at or greater than 1000 g/t Ag. Following up on this opportunity, Silver Bear has initiated near surface drilling on its Vertikalny deposit. Drilling commenced in October of this year with a total target of 3000 meters of drilling planned. Good progress has been made with Silver Bear having drilled approximately 1800 meters to date. During this past summer, the Silver Bear team completed over 11,000 cubic meters of trenching. Trenching was focused in areas around the Vertikalny prospect and in the Mangazeisky North zone within the exploration license area. Mineralization was uncovered in all of the 25 trenches which were excavated. Of the 25 trenches completed, 5 trenches were located in areas where no previous veins or mineralized zones had been mapped. Within these 5 trenches, the mineralization appears to be similar to those elsewhere on the property, which contain high levels of galena minerals containing silver. These samples have typically returned some of the highest concentrations of silver on the property. More detailed mapping of the trenching is being prepared. Assays are pending for both the current drill program and the trenching conducted through the summer. *All estimated mineral resources set out in Table 1 above are based upon estimated mineral resource calculation prepared in accordance with NI 43-101 using a cut-off grade of 1000 g/t Ag. These Zones form part of an overall NI 43-101 resource as detailed in Table 2 here in. Please refer to cautionary note for Table 2 below. Mineral resources that are not mineral reserves do not have demonstrated economic viability. Due to the uncertainty of measured, indicated or inferred mineral resources, these mineral resources may never be upgraded to proven and probable mineral reserves. The effective date for the Vertikalny resource is September 28, 2011 while that of Nizhny Endybal is September 20, 2012. Cut-off grades for the Vertikalny resource and Nizhny Endybal resource are 181 g/t Ag and 75 g/t Ag respectively. All in mining and processing costs for Vertikalny and Nizhny Endybal are $106/tonne ore and $80/tonne ore respectively. Mr. P. Gribble, FIMMM, C.Eng., formerly Sr. Geologist of Tetra Tech WE Inc., is the independent qualified person who prepared the mineral resource estimates disclosed above. Paul Daigle, P.Geo., of Tetra Tech, is a qualified person and has reviewed the information in this press release. Nick Vessenine (Ph.D. Mining, Moscow State University) has reviewed the technical information in this press release. Mark Trevisiol, P.Eng., President and CEO of Silver Bear, is a qualified person under National Instrument 43-101 and has reviewed and approved the content of this press release. This release and subsequent oral statements made by and on behalf of the Company may contain forward-looking statements, which reflect management's expectations. Wherever possible, words such as "intends", "expects", "scheduled", "estimates", "anticipates", "believes" and similar expressions or statements that certain actions, events or results "may", "could", "would", "might" or "will" be taken, occur or be achieved, have been used to identify these forward-looking statements. Although the forward-looking statements contained in this release reflect management's current beliefs based upon information currently available to management and based upon what management believes to be reasonable assumptions, Silver Bear cannot be certain that actual results will be consistent with these forward-looking statements. A number of factors could cause events and achievements to differ materially from the results expressed or implied in the forward-looking statements. Such risks factors include but are not limited to the uncertainties inherent to using historical exploration information collected in accordance with Russian standards, the risks inherent to conducting business in Russia and risks factors identified by Silver Bear in its continuous disclosure filings filed from time to time on SEDAR. These factors should be considered carefully and prospective investors should not place undue reliance on the forward-looking statements. Forward-looking statements necessarily involve significant known and unknown risks, assumptions and uncertainties that may cause Silver Bear's actual results, events, prospects and opportunities to differ materially from those expressed or implied by such forward-looking statements. Although Silver Bear has attempted to identify important risks and factors that could cause actual actions, events or results to differ materially from those described in forward-looking statements, there may be other factors and risks that cause actions, events or results not to be as anticipated, estimated or intended. There can be no assurance that forward-looking statements will prove to be accurate, as actual results and future events could differ materially from those anticipated in such statements. Accordingly, prospective investors should not place undue reliance on forward-looking statements. These forward-looking statements are made as of the date of this release, and Silver Bear assumes no obligation to update or revise them to reflect new events or circumstances, unless otherwise required by law.